Diane Kappa: trends I love! Once a month I head to the magazine shop in the mall and buy my favorite home and fashion magazines. It is an expensive day as magazines in English are $$$$. I could buy American magazines, but why? They cost the same (if not more) than the British ones. And the British magazines are far better for print and pattern! To give you an idea of cost: British Vogue $12, British Homes and Gardens $13.50. I fortunately have a subscription to Elle Decoration. So, the trip is usually an easy $25-$40 on magazines! It kills me to spend this much but I get so much inspiration from them. 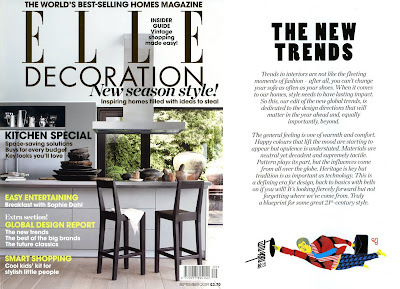 September Elle Decoration has a great article about home trends. I find it so inspiring and right up my ally!! Click on the below image and it will enlarge so you can read it. Why don't you get subscriptions to these other magazines? can you smell the salt in the air?